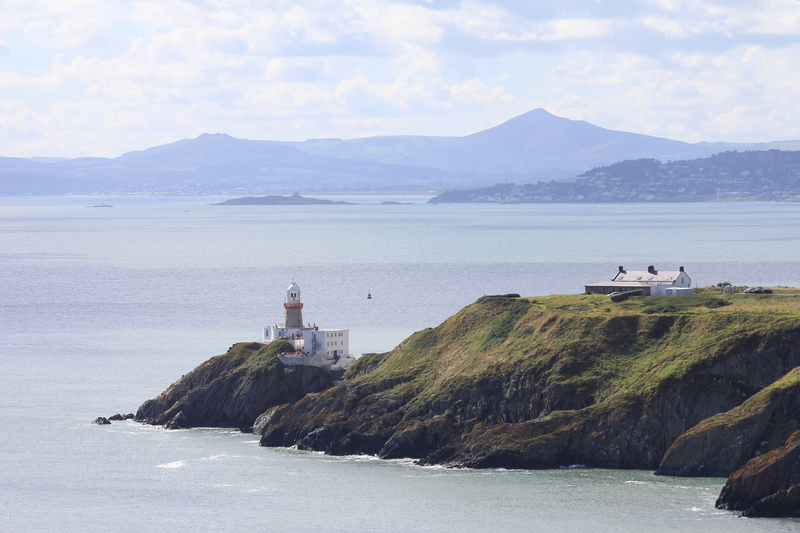 The last of Ireland’s lighthouses to be automated, the Baily Lighthouse on Howth Head lies to the north of Dublin Bay, while Dalkey Island and the Muglins lighthouse are to the south. The double summit of the Little Sugar Loaf and the conical summit of the Great Sugar Loaf are visible beyond. Whereas most Wicklow summits were rounded by glacial action, the Great Sugar Loaf was a nunatak protruding above the ice, and so escaped erosion. Its conical shape and exposed quartzite summit gave rise to its name. West Wicklow also has a Sugarloaf Mountain, as does Cork, although the more modestly named Sugarloaf Hill on the Tipperary/Waterford border is the tallest of them all. Sweet.